Are you looking for places to recycle electronics or hazardous waste – or shred confidential papers? Following are lists of events for disposal of electronics and household hazardous waste, and paper shredding. They are free or low cost. Note: Household batteries can be tossed with regular trash. However, for those with terminals on the same side (such as 6V, 9V or 12V) and button-cell batteries (used in watches, greeting cards and hearing aids), it is important to cover both ends with masking tape to reduce the risk of short-circuiting and fire. For the more common batteries (AA, AAA, C and D), cover the positive terminal (“+”) with masking tape. Every effort is made to ensure accuracy of the information provided. It is suggested you verify dates, times, residency requirements, fees, quantity limits and what’s acceptable before going. There may be more events than these so you may want to check other sources. Following are permanent drop-off locations for four southeastern PA counties (at this time, no information for Bucks County was found). Police Court Yard 24/7 or Public Works Facility 7 a.m. to 3:30 p.m.
Mon. to Fri. 8 a.m. to 3:30 p.m. Sat. 10 a.m. to 2 p.m.
Mon. to Fri. 7:30 a.m. to 3:30 p.m. Sat. 8 a.m. to 12 p.m.
Mon. to Fri. 8 a.m. to 3 p.m. Sat. 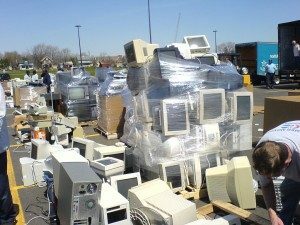 9 a.m. to 2:30 p.m.
Computers, monitors, TVs, cellphones and other e-waste are accepted at all HHW locations for residents only. Sanitation Convenience Centers are open Monday through Saturday, 8 a.m. to 6 p.m. except City holidays. Click here for more info. See locations below. 3033 S. 63rd St., near Passyunk Ave.
300 block Domino Lane, near Umbria St.
State Rd. & Ashburner St.
Best Buy stores accept most electronics and large appliances from residential customers at no charge (go to bestbuy.com for info). Staples stores offer free technology recycling (go to staples.com for more info). Note: nail polish and cellphones are on the HHW list. Note: There is no need to remove paper clips or staples. Note: Titan Mobile Shredding may cancel events due to inclement weather. Call 267-362-4249 with questions. $10 for each copy paper box or equivalent (cash or check), one box minimum, no maximum box quantity, no reservation required. More events will likely be added in the fall so check your sources for local information. Some state and local politicians host shredding events so you also can contact your elected officials. You are encouraged to recycle and shred whenever possible. Find out the regulations and disposal methods in your area by contacting your trash hauler or local government office. It feels good to do good! Free Shredding Events Are Back!